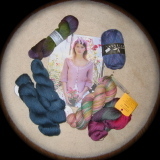 (mis)adventures of spindlerose: If I knit it right away, does it count as stash? If I knit it right away, does it count as stash? I admit it. I fell off the no yarn purchases wagon earlier this month. I checked out the Superbowl Sunday sale at a new to me, but local, shop. And a bunch of Alpaca with a Twist followed me home. 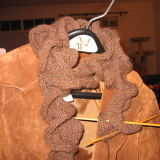 I've already turned the two skeins of Baby Twist into most of a Ruffles scarf that matches my sweet suede blazer perfectly. But two skeins of this yummy yarn does not make a long enough scarf. Tomorrow morning, I'll be phoning In Stitches to see if they have another ball in stock. I also bought two skeins of blue Fino (75% alapaca / 25% silk) for a shawl to be named later. The next day, I drove to Richmond to give a presentation. And I found yarn before my talk. A ball of mostly blue Trekking pro natura came home with me. That was sock yarn at a new-to-me shop found on my travels (The Knitting Basket), so it does not count (see Exception 3) against the no new yarn resolution. 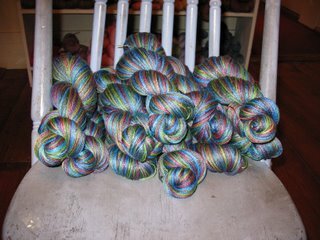 And to come completely clean, I missed the Rockin' Sock Club instruction not to combine the sock club payment with an order, and a skein of Puck's Mischief arrived in early January. Coincidentally, making a purchase with the Sock Club charge saved me from having my payment returned. And I'm off to Boston on Friday—where I will see Lucy and pick up my latest Minds Eye sock club skein. I'll probably also visit Woolcott, and maybe Wild n Wooley. There will be no shopping on those visits. Only hanging out at the table and catching up with old friends. *Before the real Valentine's Day gift arrived in our living room. Which we are enjoying tonight snuggled on the sofa with the kitty-girls watching the BC-Duke game while sipping bubbly.